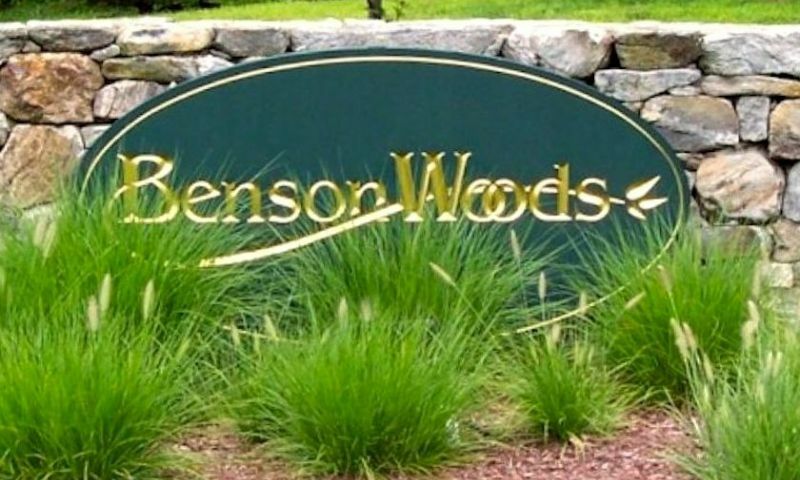 Benson Woods is a 55+ community in the charming town of Middlebury, Connecticut. Active adults will love the quiet setting and scenic landscaping that is bordered by Eight Mile Brook. Adults 55 and better can enjoy a low-maintenance lifestyle while living in a beautiful classic New England-style home in a charming age-restricted neighborhood. Active adults can enjoy all of the social and physical activities that will be held at the proposed clubhouse in Benson Woods. The clubhouse will have a fully-equipped fitness center where homeowners can stay fit and avoid gym membership fees. There will also be a multi-purpose room and plenty of scenic outdoor space with walking and biking trails surrounding the community. Construction at Benson Woods began in 2004 and upon completion will have a total of 79 residences. Benson Woods consists of single-family homes and duplex homes, which feature high ceilings, great rooms, large master suites on the first floor, second-floor lofts, dens that can be converted into second bedrooms, porches, full basements, and plenty of storage space. Every home in Benson Woods is designed in a classic, New England-style that showcases the picturesque beauty of Middlebury. Benson Woods provides active adults with plenty of living space that's great for entertaining guests. All homes have one to two bedrooms, two-and-a-half bathrooms, and a two-car garage. Duplex homes offer 2,557 square feet of living space and single-family homes offer 2,471 to 2,557 square feet of living space. Homeowners living in Benson Woods can enjoy their free time instead of worrying about exterior home chores due to the homeowners association (HOA) fee. The HOA fee includes lawn maintenance and exterior home maintenance. Active adults can spend time relaxing, socializing or strolling through the 96 acres of beautiful natural space. Middlebury is a beautiful town full of classic New England charm and lush landscaping. Active adults have easy access to Interstate 84. Some of the area attractions include the Palace Theater, Quassy Amusement Park, The Timex Museum, and Sandy Beach Swim Club. There are also plenty of shopping and restaurant options nearby. Residents also have easy access to nearby cities like Danbury and New Haven, which are 22 miles away as well as Hartford, which is only 35 miles away. For farther travel, residents can head to Bradley International Airport in Hartford, which is only 49 miles away. Active adults will love living in a charming 55+ community that has amenities and attractive scenery in Benson Woods in Middlebury, CT. Check back soon for more information on the lifestyle in Benson Woods. These beautiful attached homes offer 2,557 square feet of living space. They have one or two bedrooms, and two-and-a-half bathrooms. The Haines model has a two-car garage underground, while the Westwood model has an attached two-car garage. These homes feature nine-foot ceilings on the first floor, full basements, porches, plenty of storage space, large master suites, and a den that can be converted into a second bedroom. These elegant single-family homes offer 2,471 to 2,557 square feet of living space. They have one bedroom, a den, two-and-a-half bathrooms, and a two-car garage. The den can be converted into an additional second bedroom. These homes feature spacious floor plans, high ceilings, full basements, and large master suites on the first floor. My husband and I love living at Benson Woods. The neighborhood is gorgeous! There is beautiful landscaping and mature trees, it is very peaceful and so charming. The architecture of every home is unique and it is a far cry from so many of those other cookie-cutter looking neighborhoods. If you are looking for a one-of-a-kind community with top notch quality, you should come check out Benson Woods! The area is also fantastic with everything you need close by but yet the neighborhood is very quiet. We are very pleased with our decision to build a home here! 55places.com is not affiliated with the developer(s) or homeowners association of Benson Woods. The information you submit is distributed to a 55places.com Partner Agent, who is a licensed real estate agent. The information regarding Benson Woods has not been verified or approved by the developer or homeowners association. Please verify all information prior to purchasing. 55places.com is not responsible for any errors regarding the information displayed on this website.